We have just launched a free Japanese quiz service with free quizzes every day at four skill levels (introductory Japanese, beginning Japanese, intermediate Japanese, and advanced Japanese). The interactive Japanese quizzes cover a variety of Japanese and Japan-related topics, and allow Japanese students to test their skill in Japanese vocabulary, grammar, Kanji, and reading comprehension. A large number of quizzes focused on the Japanese Language Proficiency Test (JLPT) is also included, just in time for JLPT test takers to do final study and preparation for the upcoming JLPT. 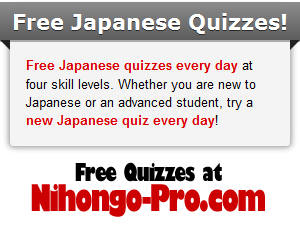 The free daily quiz service is available to all visitors to Nihongo-Pro.com. If you register, you get more freebies, such as tracking of your individual quiz results and access to the Nihongo-Pro 24/7 video chat room. Nihongo-Pro is the first online Japanese school to make the chat service available to students and visitors alike, making for a more engaging conversation. The quiz service is also unique among online Japanese schools. "Through services like our free quizzes, we hope to raise awareness of the value of our private Japanese lessons, and help everyone learning Japanese," Nihongo-Pro president Terry Phillips remarked. "It's common to think of Japanese as impossibly difficult, but that simply isn't true. Success in learning Japanese comes from patience, perseverance, and practice. By spending a few minutes every day taking our free quizzes, for example, a Japanese student can make steady and definite progress in learning Japanese. A JLPT student who takes our JLPT quizzes every day for three months can accumulate hundreds of JLPT practice test questions for free . It's a simple investment of time to learn Japanese online that can pay off big." According to Phillips, the free quiz service is just the first of several free services in Nihongo-Pro's expansion plan. Interactive games targeting Japanese learners are due to be introduced soon, and the online school is making plans for service expansion beyond private Japanese lessons. Phillips added, "We're striving to make Nihongo-Pro the best place to learn Japanese online--whether through free services to the Japanese learning community, our private Japanese lessons, or new lesson formats we are planning. Three things set Nihongo-Pro apart from the competition: free services like the quizzes, the quality of our customized lessons, and the quality of our Japanese teachers. Because we pay our teachers much better than most online Japanese schools, our teachers in turn build better lessons." The other day in my online Japanese lesson, we were doing a JLPT reading comprehension question. For those of you not familiar with the JLPT (Japanese Language Proficiency Test), the reading comprehension portion consists of short, medium, and long passages of Japanese text, followed by one or more multiple-choice questions about the passage. This passage was a reading on Buddhism, so not only were the sentence structures difficult, but there were new vocabulary words and concepts. In all, it was a difficult Japanese reading problem for me. When it came to answering the question, I was confused. The question concerned the central point of the essay, yet I couldn’t find the right answer. That’s when my teacher led me through to the answer, and, in the process, showed a fundamental difference between Japanese and English. Japanese is upside down, or backwards to my way of thinking, if you will. This passage on Buddhism—as most Japanese writing—is structured in almost reverse order from a typical English counterpart. I don’t mean simply that the verb comes at the end of the sentence in Japanese, or that there are Japanese particles with no English translation tacked onto the end of words. I mean that the author’s conclusion appears at the end of the passage, and that his supporting statements appear before his conclusion. Most English writers would start an essay with a brief statement of their opinion (the thrust of their argument), and then follow that with their supporting reasoning and description of the overall situation. Japanese is just the opposite—a Japanese writer will describe the situation, briefly point to opposing views, and sum up his opinion as a conclusion, often by way of a rhetorical question (～でしょうか or ～だろうか). 起 (ki, to occur or arise): The story’s beginning. Introduce the reader to the situation and characters involved. 承 (shou, to receive or accept). “Receiving” the material introduced in起, dig deeper in this step. Give a full, objective explanation of the situation, so your reader understands the context and detail of your topic. 転 (ten, to turn). The crux of the writing, 転 is where you grab the reader’s interest with a surprising or novel “turn.” The転 section often starts out with しかし (however ...) or そして (and...), meaning the writing is about to guide the reader in a direction the reader didn’t necessarily expect. 結 (ketsu, to conclude or tie together). With the unexpected turn of転 in mind, draw your final conclusion. This is where Japanese opinion writers will state their opinion, as a natural follow-on to the explanation of 承 and the twist of 転. 起is the start of the ride, as the chain starts pulling your car up that long hill. You’re going slow, getting used to the new environment. 承 takes over as you get higher up the hill. You’re still moving slow, but you’re up high now, and can see the landscape much better. 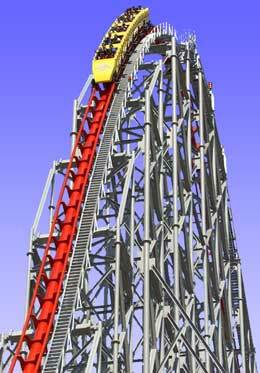 転 hits when the chain releases your car, and you start speeding down the hill. Just when you thought you knew the landscape (going up, up, up slowly but surely), the whole scene changes, and you’re experiencing an entirely different side of the roller coaster. 結 is the coasting from the last hill to the end of the ride, a chance to wrap up, cool down, and take in what you’ve just experienced. If you’re a manga fan, you probably know that 4-cell manga usually follows the 起承転結 sequence as well. Indeed, the four-step sequence of 起承転結 is the very reason for the popularity of the 4-cell manga! So maybe Japanese isn’t upside down after all (roller coasters are a lot of fun, too), but my English-thinking brain still gets easily led astray when I try to tackle a Japanese essay. Japan is in the midst of starting recovery from the massive earthquake and tsunami that struck the Tohoku region on March 11, 2011. Many of us have seen the horrific scenes of total devastation from the tsunami replayed on countless videos. The city of Miyako in Iwate prefecture was devastated, despite a 10-meter (33-foot) seawall designed to protect the city from tsunamis. This time, the giant wave easily topped the wall, and surged into the city. The heartbreaking scene of Miyako’s destruction has been played over and over on Japanese TV, a grim tribute to the force of the earthquake and the tsunami. As I watched the scene from Miyako, I thought, “If only that seawall had been a little higher...” If only the area had been protected just a little more, perhaps those people would have been spared the worst of the tsunami. Happily, there was such a place: the village of Fudai (普代) in Iwate prefecture. 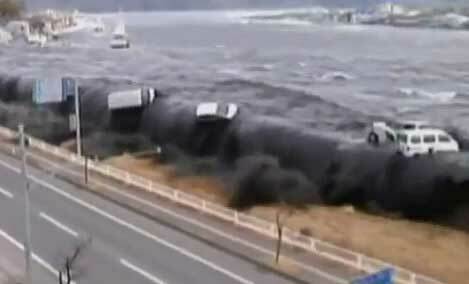 Fudai was protected by a 15.5-meter (50-foot) seawall, and the tsunami was no match for it. Fudai had no deaths in the disaster. The story of how Fudai came to have such a high seawall begins with the great earthquake and tsunami in 1896, during Japan’s Meiji period. That year the village was struck by a 15-meter (49-foot) tsunami, and again in 1933, the village suffered another powerful tsunami. Altogether, 439 lives were lost. Following those tsunami, village mayor Kotoku Wamura (和村幸得) pressed for a seawall at least 15 meters high, often repeating the tales handed down to him growing up: that the devastating 1896 tsunami was 15 meters. The project was a huge one—a wall to hold back a surging wave five stories high and over 200 meters (650 feet) long. During the planning stage, there was strong opposition to building such an excessively high wall—after all, a 10-meter wall, dubbed “the Great Wall,” had protected parts of nearby Miyako City from the tsunami caused by a Chilean earthquake in 1960. But Wamura did not budge, insisting on a 15-meter-plus wall. “明治に１５メートルの波が来た” (In the Meiji earthquake, a 15-meter wave came), he was fond of reminding skeptics. Wamura prevailed, and the seawall was ultimately completed in 1967. Floodgates were added in 1984. As the tsunami approached on March 11, about 100 dock workers took refuge on the top of the big wall, and not one got so much as wet feet. In contrast to the accusations of inadequate disaster planning on the part of Tokyo Electric at their Fukushima nuclear power plant, Fudai is a reminder of the power of one man's vision and determination. Wamura knew what had to be done, overcame protests from all sides, and, in the end, saved his village and its people. 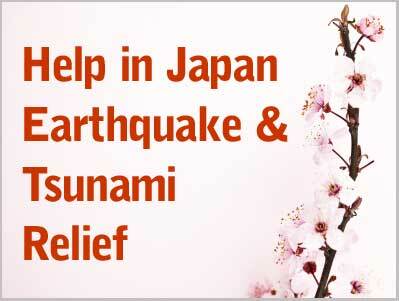 Nihongo-Pro is raising money for earthquake and tsunami relief operations in Japan. In addition to a corporate donation, the company pledges an additional $10 donation for each contribution received via the Nihongo-Pro web site through April 30, 2011. One of the first things you discover when you learn Japanese is that the verb in a Japanese sentence always comes at the end of the sentence. ano hito wa kaimono ni ikimashita. Toukyou no fuyu wa kibishii to omoimasen ka? Don’t you think Tokyo winters are severe? OK, in the second example, there’s ka at the very end, turning the sentence into a question. Simple particles like ka, ne, yo, or even ze, zo, and na do come after the verb in a Japanese sentence. Japanese Words in Any Order? I gave him an apple yesterday. Before you start randomizing your Japanese word order, remember that I said grammatically possible—not all of these sentences are natural Japanese. Ringo-wo kare-ni kinou agemashita is particularly unnatural, but still grammatically correct and understandable by any native Japanese. My Japanese listener would hear: “Yesterday he gave an apple (to someone else).” And confusion would result. One of my difficulties with listening comprehension in Japanese (such as JLPT listening comprehension exercises) is correctly hearing these very short particles, which have a big effect on the meaning of a sentence. There are many cases where changing ni to ga or vice-versa causes the meaning to be exactly opposite. The writers of the JLPT know this, of course, so they (evilly) set out to make some of the JLPT exercises difficult in precisely that way. If you are learning Japanese, watch your particles (and be sure the verb comes at the end), and you’re sure to be speaking more natural Japanese. You hear it all the time—to an untrained ear, it seems like a Japanese speaker talks much faster than we expect. I worked till 10 o’clock last night. The syllables in Japanese are very short, so they can be uttered quickly and with very little mouth movement. Japanese talk faster to get out all those syllables, but the rate at which they communicate is about the same as anyone else. To a Western ear, though, hearing all those short Japanese syllables takes practice. My brain is trained to pick up new English words of 3 or 4 syllables, maybe 5 at most. But in Japanese, a new word might have 8 or 9, even 10 or more syllables. Even if I listen closely, I have trouble picking up the last few syllables, and often wind up asking my Nihongo-Pro teacher to repeat a new Japanese word several times. Atatakaku natta no dewa nakatta ka? I didn’t know if it was there or not.